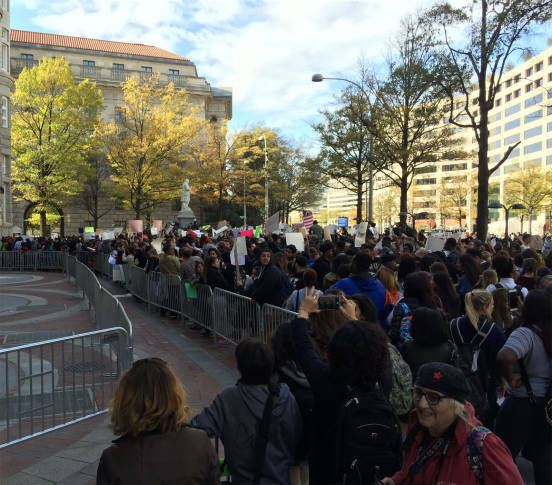 Hundreds of high school students across D.C. walked out of class Tuesday in protest of last week's election of Trump to the presidency. WASHINGTON — Hundreds of chanting and sign-waving high school students around D.C. walked out of class Tuesday, gathered in front of Donald Trump’s luxury hotel on Pennsylvania Avenue, and then marched to Capitol Hill in protest of last week’s election of Trump to the presidency. The walkout came a day after hundreds of Montgomery County high school students left class and marched through downtown Silver Spring for several hours Monday morning. Student groups at Wilson High School, in Northwest, had planned a walkout in which students would leave class, meet at Metro Center at 1 p.m., then march to the Trump International Hotel, on Pennsylvania Avenue. The large crowd of students temporarily halted several downtown streets as they made their way up Pennsylvania Avenue, although the protests remained peaceful. “This is a peaceful and positive demonstration meant to send one message to our future president: He can’t divide us,” student organizers of the protest from Wilson High School wrote in an Instagram post before the march. The protests began shortly after noon. Around 3 p.m. a separate group of protesters from George Washington University marched from campus to the White House, which also led to rolling street closures, D.C. police tweeted. In a letter to the Wilson High School community, principal Kimberly J. Martin said that school administrators are aware of the planned protest, and that while “we defend all students’ right to self-expression and peaceful protest,” the march is not sanctioned by Wilson High or the D.C. Public Schools. Students from Sidwell Friends, also in Northwest, planned to walk out of class around noon Tuesday to take part in the protest. Students will be granted excused absences to protest if they have their parents’ permission, according to an email sent to Sidwell Friends teachers and parents.